Welcome to the Night Vision remix contest. In association with FL Studio singer/songwriter Veela and our friends at RØDE microphones & Event Electronics we are excited to bring you our most awesome remix competition ever! 1st - A pair of Event 20/20BAS monitor speakers (valued at $1099) + 500 USD Cash + any 3 Image-Line plugins. 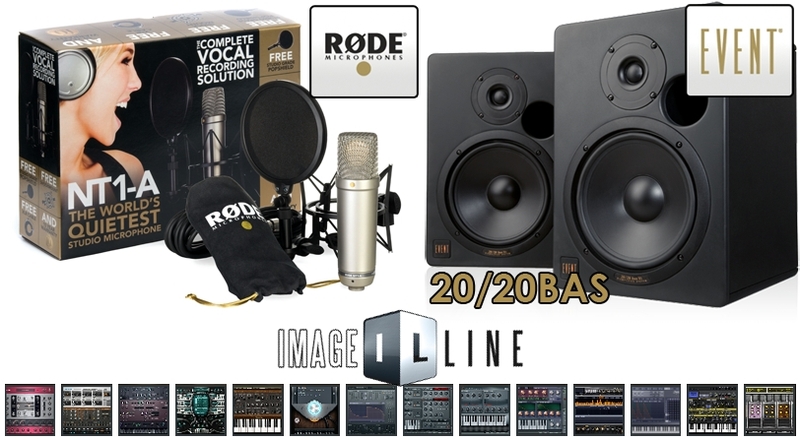 2nd - A RØDE NT1-A kit (valued at $299) + 250 USD Cash + any 2 Image-Line plugins. 3rd - 150 USD Cash + any Image-Line plugin. 1. You must have an Image-Line account and posting permissions on the Image-Line forums. 2. You must use FL Studio AND the plugin Newtone AND OR Pitcher in the production of the remix. You may use any other Image-Line or 3rd party plugins and or samples (samples must be copyright cleared for music production). 3. You must use at least one vocal sample from the Veela remix pack. 4. You must upload your 192 kbps .mp3 remix/es here (in Looptalk). By uploading you grant Image-Line permission to host the remix file/s on our servers in perpetuity. 5. You may enter a maximum of 3 remixes. 6. Winners will be asked to submit the FL Studio remix .zip project for verification that the remix was made with FL Studio and to explain how Pitcher AND OR Newtone were used if it is not evident. 7. Competition closes June 5, 2011. 8. In order to collect the 1st & 2nd physical prizes winners agree to supply Image-Line and RØDE/Event with a delivery address (no PO boxes allowed). 9. In order to collect the cash prizes you must have a PayPal account, if you don't have a PayPal account at the time of winning we can add the money to your Image-Line account which can be withdrawn to a PayPal account once established. Alternatively, you can use the money to buy products from the Image-Line Shop. 10. Judges decisions are final, no correspondence will be entered into. Entries will be judged by a panel including Veela, RØDE/Event & Image-Line representatives.